Saturday: Hung out with a guy from the D.C. area, who was in my dorm. A decent guy, ex-military, currently does security type work on contract, and studying international something at a college (may be an assassin). We found a Brit and an Aussie to watch the US/England world cup match with and searched for a local hangout. Stumbled upon the ¨Cafe Colombia¨, an old school guy hangout in the heart of the city. Containing a small TV area with plastic tables in front, a large pool table area, slot casino in back, poker tables up a floor, and completing the man cave – a trough urinal openly installed on a main wall. A lot of action all around, with some guy trying to get us to place wagers and many people hawking lottery tickets. A fun game to watch with the Brit left shaking his head and us feeling very satisfied. 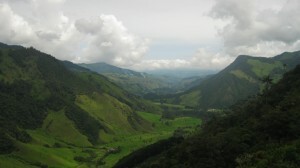 Back at the dorm, a Brit girl joined our group seeking Colombia travel advice. Being the only one heading south, I dispensed what I could to all interested parties and soaked up valuable info about my next destinations. They now have me excited about future treks and volcano watching. Later: The Brit girl (Lucy), the D.C. guy (J), and I hit the town for street food and drinks. After checking out a few overpriced bars, we found a small cheap liqour store with 2 tables, and sat. Aguardiente, an anise flavored drink, is the liquor of choice down here, and it doesn’t taste too bad. The highlight of the evening was the inebriated man, close to my age, who wanted to talk. He slowly forced out the few English words he knew and I tried to move the converstaion along with the even less Spanish I knew. At one point, an older lady came to the entry of the shop and called the man over. A few minutes of what seemed to be scolding and finger pointing, had the room holding back laughter. The 3 other Colombians around (all 20 something and one spoke English) told us that it was the man’s mother-in-law, and that she informed him that all of his things would be on the street when he got home. Undeterred by the news, the man proceeded to restart the talk and share shots. The whole scene highly amused me, despite a lack of understanding. After parting ways with the town drunk, we hit a salsa club with the 3 Colombians from the store. Interesting to watch, though I did not participate. A few songs were too slow but when they moved, it was with ease and grace. They move their hips to the beat and stare off, nonchalantly, like they were walking. Sometime on this trip I will try, just not on that small floor during our short visit. Sunday: I continued my journey south, to the town of Pasto. A man from wee Britain, was heading my way, so we traveled together. He had taken classes in Medellin and was a master at the art of flirting. That came in handy when he bargained our bus prices down and when he chatted up a pretty lady, a row in front of us. He did it with words I could understand, he just knows how to put them together. We crashed in Pasto 2 nights, he was sick the next day, so I headed off to see ¨Laguna de la Cocha¨, a good size lake with a densely forested island. 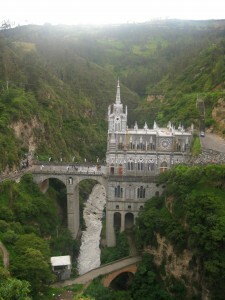 Tuesday: Farther south to Ipiales, 3 km from the border, where we parted ways and I headed to nearby Las Lajas. A small village around a stunning church, I shacked up at a large hostel, formerly run by nuns. Being basically the only person there, I got views of the canyon and the Santuario that spans it. The next morning I was awaken by the sound of a marching band. Looking out my window, I saw them coming down the hill and suited up (it was raining) to check out the action. 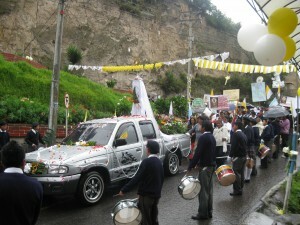 Young kids pounded drums, leading a caravan of cars, all for a gold relic on the back of a truck. The streets were decorated with yellow and white, but they misjudged the height by a little bit. I snapped the photo below, seconds before the relic caught the overhanging line and fell off it’s pedestal. The parade stopped for about 10 mintues while they tried to fix it, with onlookers looking very concerned. 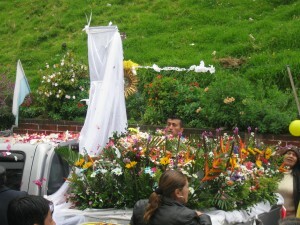 It ended up just being carried to the church by a man in a coat, where it was prayed to all day. That night, I followed as a procession took the relic to a chapel in town and from there I can’t tell you what happened (Not because of any laws or anything, I just don’t know). A good day to be in Las Lajas, and people thought I was crazy for wanting to stay in this small one-church town, for 2 nights. I don’t know how I would have survived this past week without my titanium rain jacket, made by Colombia Sportswear, product # 205 SM7478. It is the wet season, so please don’t feel sorry for me, no matter what I say in the next few paragraphs. It began in San Agustin, a little sprinkle the first night while I curled up in my hammock. Then steadily increasing throughout the morning, before the downpour during my walk to the market. Turning Monday into a good day for a blog post. It continued throughout my stay, but the show must go on. 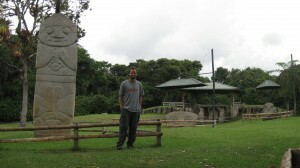 I saw most of the main sites, including the signature Archeological Park, despite my moto-taxi breaking halfway there. A well preserved area, with many rock carvings guarding tombs and a nice round path they’ve lined with 35 interesting figures. I also attempted a hike to sites normally seen on horseback, resulting in a wet muddy affair. Not really worth the effort, but I do love getting dirty. The highlight of my stay in San Agustin was hanging out at the hostel. No ping pong was played, but I met some more cool people. Two more British girls as roommates, a guy from NoCal, a girl from Germany, and a talkative Aussie gal. With the kitchen connected to my room, I got to witness money saving ways to feed yourself, with the cheapest being, hangout and eat their leftovers. Although, I still think the best value was the $1 – $1.50 full meals I was getting from the market every morning. If only every town had a daily mercado where I could sit at a counter with the locals. I completed my circular tour of central scenic places, with a 5 hour bumpy bus ride back to Popayan. Three nights were spent there, a slight altering of my original plans. The Aussie guy I met in the desert, showed me pictures of a hike he did around these parts. I had thought the trip was too difficult and expense, thus passed on it my first go around, but he painted a different picture. Stunning scenery, a way around the park entrance fee, and my male ego, all sealed the deal. Friday: I set my alarm for 3:45 am to catch the bus out of town, got on the right bus, was dropped off at the turnoff around 6 am, and began to put one foot in front of the other. 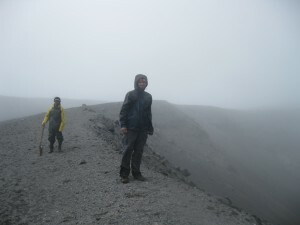 Destination: The rim of Volcan de Purace (a volcano that last erupted in 1949). With the early start, I was able to cruise past the dreary eyed visitors center without paying the $10 fee. The trail traveresed along cow pastures, muddy forest, gravel road, rocks, and then volcanic ash. Wind and mist were a constant throughout the 4 hr ascent, with boulders providing the only shelter. I thought about turning back many times. 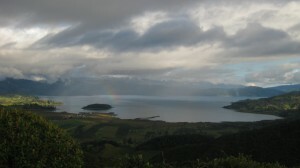 The altitude (summit = 15,600 ft) was dizzying, shoes were wet before I started, and I was tired from little food/sleep. Keeping me going, a group of 5 Colombians that caught up and eventually passed me, plus my trusty rain coat. With hood up and head down, I tried to not let my mind think that each false summit was real and plugged away, never actually seeing my finish line until the end. The conditions up at the rim were nasty, forcing rapid fire photography followed by hands inside coat. With the Colombians motioning me into their group photo, I reveled in the feeling of pushing myself beyond pain and raised a thumb. I always love the descent, the speed and the recap of what I have accomplished. At this point, I made my second great decision in the past 24 hrs (first was the night before, finding fresh street potato chips to go with my 2 street hamburgers). I was confident enough in the reply I got from a climber and my directional instincts, to take an alternate way down. Following the gravel road we briefly used in the middle, for as long as it was white. I have a theory that all roads connect to another road at some point in time, and needed to test it. The result: a smooth mud-less path, a stroll past the restricted sulfer mine, no sneaking past the visitor center, and a direct line to the main hwy. I was lucky to have a bus roll by within 30 minutes of my arrival, and sat on the hump near the driver, enjoying a victory lollypop. I really do love it when a plan comes together. Memories of being scammed in Bangkok still linger in my head. Every kind person who offers help, I keep at arms length, carefully processing every move in my head. I believe this is the way to go when traveling overseas, but also worry I may miss out on making a new friend or might offend an innocent stranger. Like the little old man in Cartagena, who reminded me of Jackie Mason. He approached me on my first day in town, trying to dispense hostel advice. Quickly moving his little legs to keep up with me, he swore his places were cheaper but I playfully ignored him. The next time I saw him was 48 hrs later, during the low point of the trip so far. I had just been told by my hostel that the city buses stopped running at 6 pm and that an expensive taxi was my only option to the bus station. Feeling lost and tired, I took to wandering the streets aimlessly, looking for some form of transportation. He saw me and warned me about walking the streets at night, offering to help. The small funny man was wiser than the hostel and flagged down a passing bus for me. It was a long sweaty ride to the station, trying not to knock anyone out with my pack, but I felt lucky to be there. Another encounter was with an odd man who approached me in the Medellin bus station, while I was bargain hunting. He happened to already have a ticket in the same direction and aided me in my purchase. The man said he was born in the US but his family moved back to Colombia when he was 2. His English was decent and he seemed harmless, but he was a little too eager to help and he strangely showed me both his passports, with the US one containing a fake $100 bill. During our trip, I kept a close eye on all of my stuff and maintained a ninja like awareness, waiting for the trap to be sprung. In the end, he was nothing but helpful in making all of my connections. I feel bad doubting his intentions, knowing now that he was probably just a quirky, talkative guy. Those are just two of the many helpful Colombians I have come across. Everyone has reacted to my broken Spanish with smiles and patience. Even at the bus station, I know that the men shouting destinations at me will point me in the right direction, even if their company doesn’t service that area. With only a few days left here, I hope the people down closer to the equator are equally kind. La gente es extraña cuando eres un extraño, rostros se ven feos cuando estás solo. Arriving in Tierradentro after a 5 hour bumpy bus ride, the 3 other gringos and I were shown reasonably priced accommodations and formed a group. Consisting of a guy from North Carolina (traveling south for the past year, with some work mixed in, I envied his beard, long hair, and Spanish), his female Canadian travel companion (they met in Central America and reunited in Colombia, she also has done volunteer work and speaks Spanish), and a young man from London (teaches English in Ecuador and has had a sitdown with the Dalai Lama). As you can see, a group I was able to learn a lot from. The only tourists for miles, we were fortunate to have a friendly shop owner across the street, little rain, and cheap meals. 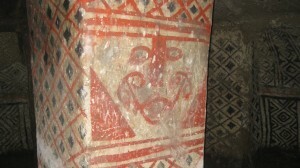 The area is known for the elaborate tombs lining the tops of the hills. A full day was spent doing the loop hike up and around the ridgeline, taking in some stunning vistas and climbing down into holes in the ground. Most of the 100+ sites have been raided, but there are a few in excellent shape and illuminated by lights. That night, another 4 random tourists rolled into town, we played a card game very similiar to my family reunion ¨Heck¨, which the Canadian called “Dutch Blitz”, and socialized. Two of the randoms were females from England who just happened to be heading back to the city of Neiva, in my direction, a day after me. One of them just finished a year of teaching there and had an apartment which I could crash at. I decided this was too good an opportunity, so I stuck around another day and acted as an uninformed tour guide while doing the loop again. The other 2 in the group: a cool German guy and a French girl, who spoke some English and picked random berries and fruits for us to try along the way. The next day, the 2 British girls and I made our way to Neiva where I got to sample some local food and a local bar. I was grateful for the free accommodations, tea, Lucky Charms cereal, and new Facebook friends. 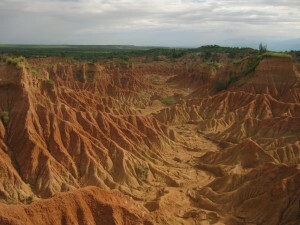 Friday morning, I headed out to “Desierto de la Tatacoa”, about an hour north of town. Fully prepared to hike the last 8 km in midday heat to the observatory, a moto-taxi driver was desperate and went down to ($5) from his initial ($10) bid. Only really worth it for the laughs that he got from his fellow drivers for going that low. At the observatory, my accommodations were in a hammock strung up between the pillars on the front porch. No privacy, constant tour groups rolling through, and they locked me out at 10 pm; the only good parts about the place were the price and the view. 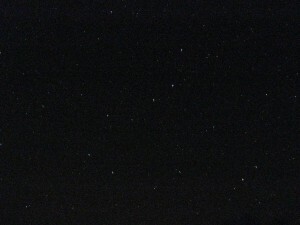 The first night, an Aussie tourist came out from town just for the astronomy presentation done on the roof. I joined him in paying a few bucks to see a guy point at things in the sky with a green lazer and to look through the telescope, mostly for the socializing. He was from Melbourne, we have played the same golf course there (Yarra Bend), and shared a love for the ¨Great Ocean Road¨ coastline. 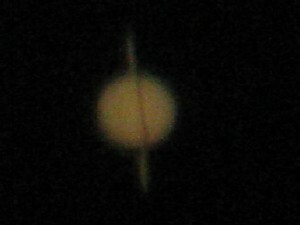 The best part about the show was the photo of Saturn the astronomer was able to capture with my camera through the scope. Saturn, it's a planet out there is space. The next day, I hiked around the desert in the stunning “Cuzco Labrinths” as my body weakend from the draining heat and lack of sleep. I gained more confidence around livestock but am now afraid of birds dive bombing me. 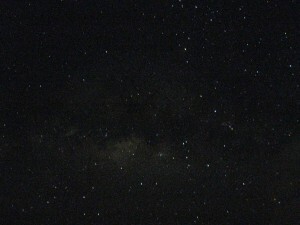 Then, splurged on some goats milk dessert and a dip in a nearby pool before taking in the night sky show. I really enjoyed flexing some photographic muscle, aided by my tripod and a lengthened shutter. Sunday, I successfully hitched a ride back to civilization, after walking 2 of the 8k. Boarded a couple of bus/truck type vehicles and am now in San Agustin, home to some statues and scenery. Another couple of chilly nights in a hammock await, but this time my room is shared with a ping-pong table. I heard stories of competetive games the night before my arrival, but will have to size up the next crop of tourists and hope for some pongers. Mockus para Presidente! Pledging to change politics-as-usual, bring transperancy to the office, and continue to stand firmly on his pro-environment platform. It is Election Day down here in Colombia, and they have their own multi-ethnic, internet savvy candidate who is firing up the younger generation via Facebook. 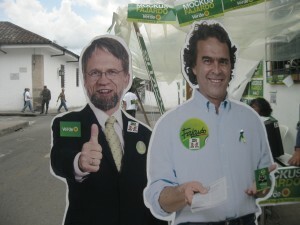 Representing the Green Party, Antanas Mockus seems set to unseat the current administration and their chosen successor, Juan Manuel Santos. Many Colombian’s believe they are ready for a government which does more than just quell gorilla attacks. Though, I personally would like to thank their current leader for making this beautiful country very safe for travel. For me at the moment though, it all adds up to being stuck in Popayan with sites already seen. Thus, I would like to share the following message with you, my constituents. Next time you get the urge to travel, make Colombia one of your candidates. I am not yet giving it my full endorsement, but do believe it is worth a look. For example, it’s well preserved colonial neighborhoods that are fun to stroll around in. 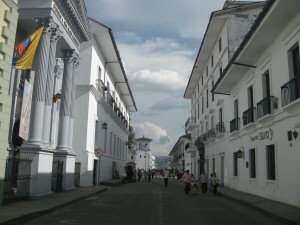 Like Cali’s San Antonio district and Popayan’s Centro, which are filled with white walls and red roofs. Something about these areas just feels safe and peaceful. You can wander aimlessly, looking at churches and museums. Every city also seems to have a hill, topped with a shrine or monument, allowing panaramic views. In Cali it is called “Cerro De Las Tres Cruces”, a steep, 1+ hour climb to three large white crosses, communication towers, and some weightlifting equipment. An interesting site to see, with a number of exercise buffs who seem to make the trek on a regular basis. Decent views at the top, better on the alternate way down. 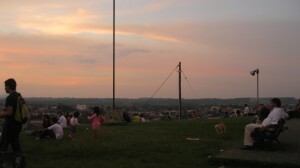 Last night, it was “El Morro de Tulcan” in Popayan, a grassy knoll providing great views of the old town and sunset. That pretty much sums up my last 2 cities, walking around the old towns and checking out every accessible vista. In Cali, I stayed in a dorm at the biggest hostel in town and got to witness the true Lonely Planet backpacker crowd. My Aussie roomates had an interesting sleep schedule, grabbing supper at 11 pm and heading out to the clubs at 1 am, a routine I was not able to follow. The next night, the election weekend “no party” period began, and I watched the Celtics/Magic game with some guys from a New Mexico. Today in Popayan: I got to sleep in, my laundry is drying, plus I enjoyed some of the finest empanadas so far, which came with a spicy avocado sauce. Since my last communication with all of you, I have been in the mountains with mixed results. I also feel the need to add the following note: I am having a great time, even though everything may not workout as planned. That being said, here is a quick recap of the past week. Salento, Colombia: Small mountain town, gateway to the Valle de Cocora, and a weekend getaway spot for well-to-do Colombians. Arriving there on a Saturday, I saw it in full bloom. Tents filled the plaza square and young men tried to force menus through car windows. I enjoyed walking the one main street and the cooler temperatures. 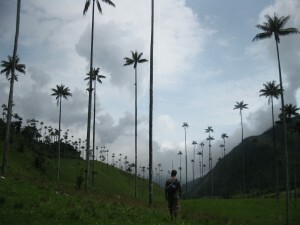 I woke up early Sunday to check out the Valle de Cocora, filled with towering Wax Palm trees and cloud covered forest. 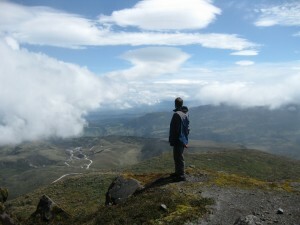 After the jeep ride out to the Cocora, I joined up with the only other foreigner in sight to walk around. A young lady who just happened to be a UW graduate from Seattle. Despite our rivalry, we walked the first hour or so together, before the trail got too dificult for her unlaced keds. She was a short timer, taking a month vacation after quitting her job and before sarting an international masters program in South Carolina. After we parted ways, the trail reminded me of hiking in the Pacific NW, following a river in thick green forest with cloudy skies. At the end of the path, a lodge served me a splendid tea with a piece of cheese and hummingbirds for entertainment. The route back was down an access road and provided amazing valley views. And also provided me with the opportunity to get up close and personal with the Wax Palm trees. Arriving back in Salento, a little bit of water began to fall from the sky, blocking any views from the hill in town, which I climbed for some reason. Leaving the next morning, the sky couldn’t have been clearer and I contemplated staying another day, but pressed on to my next mountain destination. 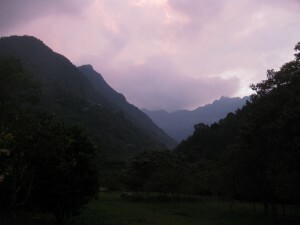 Pance, Colombia: Very small mountain town that is more of a summer camp/resort type of destination. The journey there was difficult, mostly due to the 30 minutes I spent walking around the Cali bus station, looking for the bus because of an unhelpful info desk. Upon arrival in Pance, I had to trust the old lady I asked for directions, and continue the hike uphill. My lodgings were a large nature reserve, that hugs the Rio Pance. They showed me a tent where I could lay may head and told me that their casa was my casa. 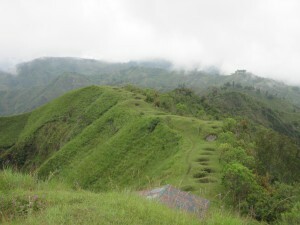 In the pic above, my campsite is at the top of the open field. In the background, you can see a glimpse of the mountains that tower above. It was a quiet place, besides the hippies that lived there playing bongos at night and singing ¨Me gusta marijuana!¨. I did a few hikes: one to a nearby waterfall and the other toward the peaks, but in the rain so no views. It rained a lot which forced me into my tent to read. The other problem: being there during the week, the place was not as willing to serve me food. I got a great meal the first night, but was unsuccessful after that, as they decided to have work done on the kitchen. This forced me into walking the 1 km into town in search of some type of sustenance from the local tiendas. One night I ate a medium size bag of potato chips and 4 different types of sugary desserts. Twice, I was lucky and a lady had some hot food on display, but that was over 3 days. So, my rain filled days of starvation in Pance didn’t go as planned. I limped back down into the city of Cali and am now drying out. I expect to stay 2 nights here before continuing south to see some ruins. I will attempt to fix my footwear with some super glue and hope that they hold up for the duration of my trip. I have been worrying about money a lot lately. Forking over $11 for a dinner in Cabo and dropping $50 on a 13 hr bus ride to Medellin, I realize that I underestimated the costs of Colombia. I may have also overestimated my ability to haggle and patience to shop around. I still have a lot to learn when it comes to finding the cheapest accommodations and food. Walking around with my pack after a hefty bus ride, I tend to pick a spot out of “Lonely Planet” and go with whatever price they offer me. I believe many of these hostels jack up their prices, once they see the constant flow of gringos one paragraph in a travel book provides. With my limited Spanish, I feel I lack the ability to properly scout the random non-published places. The Internet is a good alternative, and provided me with my current lodgings (free WiFi). Though, the owner said my room was double booked by different sites, thus I got a free “upgrade” to a room that was almost twice as much. When he showed me a room that barely fit the twin bed lying on the floor, I almost jokingly asked if my original room was smaller than this. The only difference I can see is that my new room comes with a 13 in., 2 channel TV. I can’t help but feel skeptical about every price quoted to me and every friendly local. One instance in particular, a teen running a store counter in Cabo overcharged me a dollar despite my inquisitions about the price of each item. Not sure whether he added wrong or figured he could get whatever he wanted from me. Also; my hostel which had higher prices for us than what was in the menu, lemonade guy that has 2 sizes of plastic cups, and bus drivers that see how much you will pay. Those are the ones I have learned so far, but I am by no means done getting fleeced. Today was a great exception to the life that has cost me $27 a day. Metro train to Medellin’s city center to see some sights, also led me to a massive, 2,500 stall, covered market. Many intimidating food options, packed with locals scarfing down large plates of sustenance. With no menus in sight, I almost wimped out and chose empanadas. I made eye contact with one cook and pointed to the soup in front of a man next to me. She said some things but I only heard the magic word “chorizo” and repeated it to her. The result: a huge set meal and pineapple juice for less than $2. I think the lesson here is to get away from the tourist areas, look for where the locals are gathered, and point. Feeling good about myself and a little lucky, that night I went searching for a blackjack table. I found a $1 minimum game and settled in with my fellow degenerates. After a free cerveza, some live music, and a few fist bumps from table mates I couldn’t understand, I had won about $34 dollars. A very nice haul, amplified greatly by my current situation.